Chicago PD takes a personal turn when Jay Halstead realizes he has history with a drug supplier recently released from prison. According to Jay, Matthew Garrett is ‘devil.’ He was released from prison after his arrest was labeled a wrongful conviction, however, there’s no denying the facts: he’s a dangerous heroin pusher who once killed a girl. Worst of all, Garrett was awarded $200 thousand from the state for the illegal arrest. Halstead cannot shake the murder aspect, especially when Mrs. Sanders, the girl’s mother comes to the station to point the finger at Halstead for letting Garrett walk. Since there are notes about Halstead’s tumultuous history in Garrett’s file, Voight decides to keep Halstead on the case as background. He turns to an old friend, Gus, who once locked up Garrett for some intel. 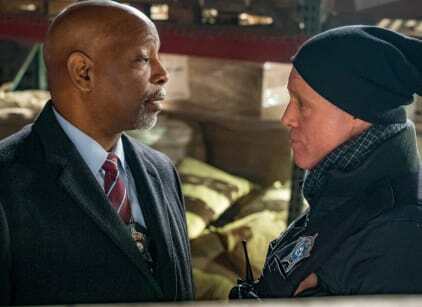 Gus, a once celebrated cop is still bitter about getting fired, though he’s more than happy to help Voight out by telling him about Garrett’s closest confidant, Tyler. Ruzek poses as Christopher, Tyler’s friend who wants to buy some of that ‘China White’ product from Garrett. Garrett is suspicious, but after ‘Christopher’s’ story checks out, he makes a deal with Ruzek on one condition: he has to fork over $50,000. Voight’s request for the money ends up on Kelton’s desk, and he’s not pleased that Voight is disobeying orders and pursuing Garrett. It seems his only concern is if this will negatively affect his Mayoral campaign if this goes sideways. Without the money Voight has no choice but to pull his unit back from the case, however, Halstead’s determination conjures up $50k in very realistic looking bills. Despite Kelton’s orders, Halstead is able to convince Voight that Garrett is dangerous and needs to be taken care of. Ruzek secures another meeting with Garrett bringing Burgess along this time. Burgess’ presence makes Garrett suspicious, but when Burgess leaves the table allowing the boys to “talk business,” he becomes really paranoid. Burgess follows Jill, Garrett's new side piece, to the bathroom to warn her. She gives her some cash and tells her to use the back exit and never return to him. Garrett is upset when he can’t find Jill, but eventually secures the deal with Ruzek. At the exchange, Ruzek and Burgess aren't content with the last minute change of plans. The only way they’ll do business is if Garrett gives them the product in person. Burgess is able to get an address of Garrett’s location from one of his lackeys, but before anyone can get there, Halstead arrivs at the scene. He doesn’t wait for back-up or obey orders of staying “background,” but charges right in. He finds Garrett bleeding out from a gunshot wound to the neck. Instead of calling for help, Halstead uses up Garrett’s last coherent moments to try to find out where he buried the body of his victim. Shortly after, Upton arrives on the scene and is shocked to see Halstead leaning over Garrett’s dead body. Upton finds out the truth and informs Jay he could go to prison not administering aid just as he’s called in for questioning. Voight pays Kelton a visit to find out why they are trying to pin this on Halstead, a good cop, but Kelton reminds him that he warned him to stay out of it. There are also discrepancies in Halstead’s story that suggest he’s the prime suspect in the murder. Voight informs Halstead that the only way to clear his name is to find the real killer. When the ballistics report comes back, the bullet is a match for a gun that belonged to Delgado, a man Garrett sometimes played poker with. Delgado is brought in for questioning, but he denies the whole thing saying he doesn’t even have the gun anymore. When he was popped in 2014, the cops took his gun. His story checks out, however, the gun was never checked in by the arresting officer, Gus. At this point, Voight realizes that he told his former cop friend that Garrett got out of prison. When Voight pays Gus a visit, he initially denies any wrongdoing before realizing that there is no way out of it. He admits to shooting Garrett because it isn’t fair that a criminal is rewarded money by the city while he was fired and forced to clip coupons for doing his job. Voight understands, but he can’t turn the other way on this one since Halstead is being blamed. Gus asks for a few minutes to get his things in order, which Voight happily gives him. As he’s walking out to the car, a gunshot can be heard indicating that Gus committed suicide. After such an eventful day, Halstead and Upton grab a beer at Molly’s. They don’t say much, but their gazes linger a little too long. Finally, Upton’s phone rings. Halstead asks if it’s Ruzek. It is. He tells her that she should go to him and she agrees, though Halstead’s facial expression reveals that it’s far from what he wanted.